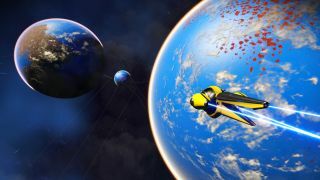 Hello Games has deployed a new update for No Man's Sky across all platforms. Update 1.63—"a large update focused on improving and extending planetary exocraft", according to the developer—has now rolled out, and includes the "rugged, fast-moving" new exocraft, Pilgrim. "The existing exocraft have also been tweaked," the studio writes in a recent developer blog. "Multiplayer racing has been fixed, inventory sizes have been increased, and summoning has been made easier. Geobays now only need to be built once – after that, all owned exocraft can be summoned with unlimited range on any planet where you’ve constructed a new Exocraft Summoning Station." There are also new upgrades for all exocraft—including the new pilgrim, of course—available from the Exocraft Technicians, plus you can now customise your preferred grip or drift levels, as well as choose from a "full range of colours, decals and boost flame effects". For more, including the full patch notes including every little tweak and revision, head on over to the official website.